Millington, TN (March 13, 2017) - The world's quickest and fastest drag radial and sportsman racers will converge upon Memphis International Raceway next week on March 22-26 for the fourth running of the Outlaw Street Car Reunion, promoted and produced by Southern Speed Promotions. With the unpredictable nature of these small-tire, high-horsepower drag race machines, it creates an atmosphere that is unprecedented in the world of drag racing. 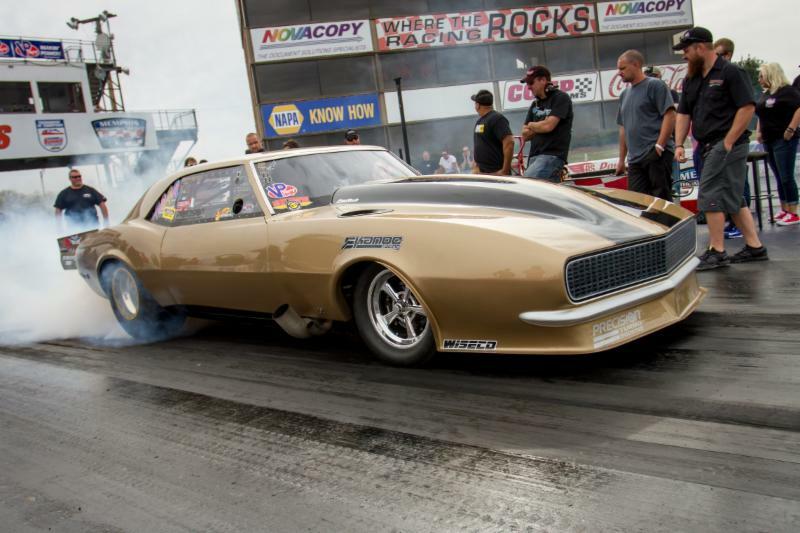 The national elapsed-time and miles-per-hour records have been falling at a rapid pace throughout the 2017 season and some of the toughest names in the game will fill the pit area at the Outlaw Street Car Reunion. "For the third consecutive season, we have raised the bar as much as possible with expanded payouts for the racers and more exciting categories for the fans," OSCR co-promoter Mark Samples said. "We try to remember that the racers come first but at the end of the day, we are producing a show that the fans in the stands want to see. Seeing the families and the younger generation of drag racing smiling and having a great time makes all the time and effort worth it." The quickest and fastest category on radial tires, Radial vs. The World, headlines OSCR IV. It features the largest purse in Mid-South history, $20,000-to-win. For the first time in the history of the class, all 16 positions will be paid thanks to the support of Billet Atomizer Racing Injectors, Strange Engineering and KTR Kustoms! X275 also is sporting their highest payout ever, $10,000-to-win, with the help of KBX Performance, Bennett Racing Engines and M&M Transmission. Holley EFI, TRZ Motorsports and Wiseco Performance Products bring the newest class in radial racing, Limited Drag Radial, to the table with a $5,000-to-win race. Racecraft, Inc. and Schoneck Composites Ultra Street gets a boost from Matters Properties to pay the largest purse in the Mid-South as well with $5,000-to-win. Jordan Grunwald's MX235 category comes back with $3,500 winner's purse, thanks to Kuntz & Company Racing Engines and McCarty Performance. New for 2017 is the addition of the Pro Street Motorcycle category with help from a host of companies and race teams, including Great Lakes Racecraft, Franklin Performance Concepts and QuickTime Motorsports. PST will pay $5,000-to-win and pay back 16 positions, just like the aforementioned Radial vs. The World category. FAST - Fuel Air Spark Technology and Strange Engineering have partnered together to bring the largest index purse to date in the Mid-South together for the 6.00 and 7.00 Index runners. It's $5,000-to-win in the main event with a 64-car qualified field that will be packed to the gills with the toughest sportsman competitors in the country. But, that's not all for the index contingent. Ultimate Converter Concepts and UPR Products partnered with Southern Speed Promotions to bring the Thursday Throwdown bonus shootout for index, guaranteeing $2,500-to-win. However, the purse grows based on car count and could also reach $5,000-to-win with 60-plus cars! That means two complete races and payouts for the great sportsman competitors who have supported us each year since the beginning. But, that's not all! For the first time in the history of the Outlaw Street Car Reunion, it has expanded to much more than a drag race! With the help of Spyder Offroad & Performance and Bell Shirt & Sign, the first annual Custom Car, Truck and Bike Show will be making its debut at the March event. Spyder Offroad & Performance will offer custom graphics and trophies for the top three in each category, along with a Best-in-Show award and cash prizes! "With the addition of numerous new faces including Competition Director and Traction Consultant Kurt Johnson and Chief Starter T.J. Bailey, the team at Southern Speed Promotions is prepared to bring forth a hardworking and dedicated contingent on March 22-26 to bring the best event possible to the racers and avid fans in the stands," OSCR co-promoter Tyler Crossnoe said. "The payouts are the best yet for our event and I'm so blessed for the largest amount of sponsor support ever to accomplish these great additions. We hope to see lots of new faces and all the returning ones from years past in the pits and in the grandstands, making OSCR IV one of the best to ever hit the Mid-South motorsports market." With all these great racers in the pits, heads up and sportsman, and now a parking lot full of the cleanest show cars in the area, the only thing missing is you! Do not miss your chance to see one of the best events in the Mid-South area on March 22-26 at Memphis International Raceway.